Harry Mercer, Rory Fraser, Mungo Somerville and Ross McCrostie. 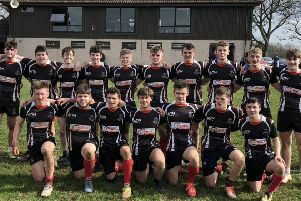 Madras Blues U18s enjoyed strong representation in the Caledonia U17 squad playing Borders and East Lothian in the final played at Galashiels. The same four players that had been in the winning team against Glasgow a week earlier were involved in another tough encounter played in bitterly cold, but this time dry conditions. After a slow and nervy start, the Caley squad found some ball and space and took the lead for the first time in the match not long after the break. Despite a large penalty count against, Caley maintained pressure, regained composure and by the end of the match looked fresh and ready to stretch their 26-17 lead when the final whistle was blown. In the 3rd/4th play-off Glasgow and Edinburgh drew 24-24. Pictured are Harry Mercer, Rory Fraser, Mungo Somerville and Ross McCrostie.